The Puget Sound region led the nation in home-price increases again, the 13th straight month that’s happened. In practical terms, buyers need to be making a lot more money to afford a mortgage. The Seattle area has now led the nation in home-price increases for more than a year — the longest streak in the region’s history. Just to keep up with those rising prices, would-be buyers needed an $11,000 pay raise in the past year to afford the typical mortgage. 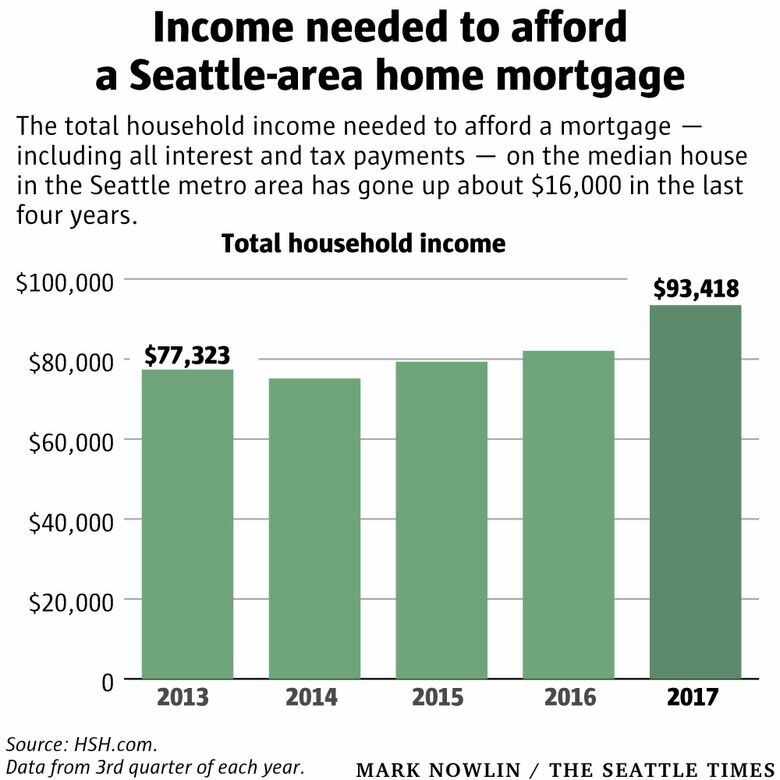 Households now need a record $93,400 annual income to afford monthly payments on the median house in the Seattle metro area, according to a quarterly report from HSH.com, a mortgage and consumer loan-information company. That figure is up from about $82,000 a year ago — a level that already exceeded the region’s actual median household income of $78,600 last year. But even that income number understates the true cost for a lot of buyers, since it assumes a 20 percent down payment, which most people don’t do. If you put 10 percent down, which is closer to the regional average, the income needed to afford typical monthly home payments jumps to nearly $110,000. And on top of all that — the actual down payment required to get a mortgage is rising along with prices, too. The median house now requires buyers to save an extra $17,000 for a higher down payment compared to a year ago. The income figure represents the average required to afford a mortgage over a broad area from Tacoma to Snohomish, so it’ll get you a home you can afford in a place like Renton or Burien. If you’re looking for a home in the city of Seattle, the income needed to afford monthly payments on the typical house would exceed $140,000. In Bellevue and other pricey parts of the Eastside, it tops $170,000. The income needed to buy a home here is seventh-highest in the country among metro areas, behind San Jose, San Francisco, San Diego, Los Angeles, New York and Boston. These calculations take into account all home-payment expenses, like interest and taxes, and assume you spend 28 percent of your household income on your home payments. Of course, this all also depends on your ability to afford the down payment, which is often the highest barrier to homeownership, especially for first-time buyers. The typical down payment across the region is $58,000, up from $41,000 a year before, according to Attom Data Solutions, which tracks home purchases nationwide. In pricey submarkets in Seattle and the Eastside, most down payments top six figures. In Seattle, the median down payment is $110,000, up from $86,000 a year before. Add it all up and even responsible savers earning middle-class incomes are watching the housing market zoom faster than they can keep up with. 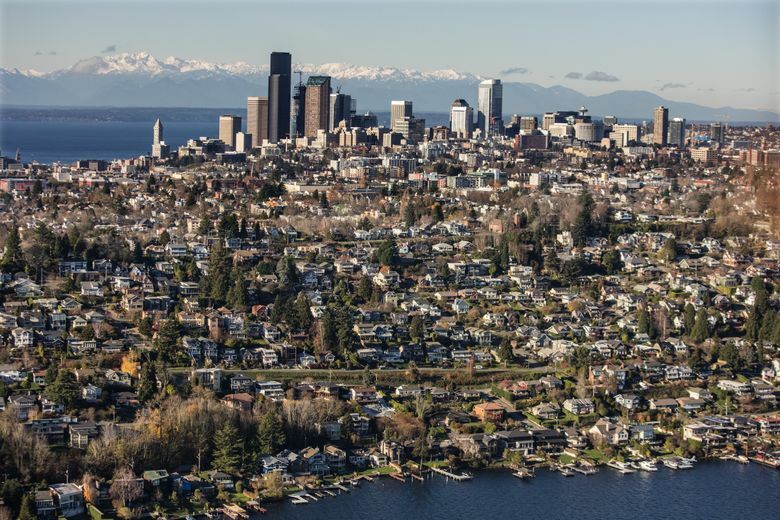 The monthly Case-Shiller home-price index, released Tuesday, showed single-family home prices across the Puget Sound region rose 12.9 percent in September compared with a year earlier, the biggest increase in the country. Las Vegas was second, at 9 percent. Seattle has had the nation’s hottest housing market for 13 straight months. That’s never happened before. 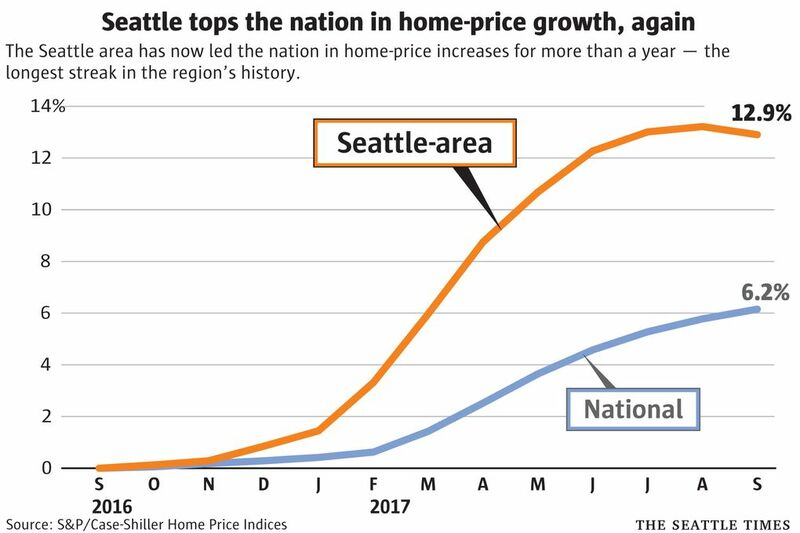 Seattle led the nation in price increases for 12 months in a row right before the housing bubble popped a decade ago. The market in Seattle has actually started to cool just a bit after peaking two months ago at 13.5 percent year-over-year growth. That runs counter to a national trend, where 16 of the other 19 regions tracked by Case-Shiller are seeing price growth accelerate. Home prices were up 6.2 percent nationally in September, the biggest gain in more than three years. And yet costs in Seattle grew more than twice as fast as the U.S. average. Compared with just a month prior, prices in Seattle went down 0.3 percent, the biggest drop in nearly three years and the largest decrease in the country. Still, home costs here often dip this time of year. The last two times this happened — in 2013 and 2014 — prices zoomed right back up again after a few months. When adjusted for normal seasonal changes, prices were still up half a percent from a month before, just shy of the national rate. David Blitzer, managing director and chairman of the S&P Dow Jones group that puts out the Case-Shiller data, noted most economic indicators nationally — like low unemployment, cheap mortgage rates and rising rents — suggest home prices will continue to rise across the country. Read more about real estate in the Northwest. “One dark cloud for housing is affordability — rising prices mean that some people will be squeezed out of the market,” Blitzer said in a statement. In some cases, rising prices put pressure on people to settle and buy now to avoid getting priced out later. Tiffany French and her boyfriend talked about that a lot during their home search as they looked to move to Seattle from Lynnwood this year. The first house they looked at was a 106-year-old foreclosure in Ballard priced at more than $500,000 that was such a dump it still had rotting food in the fridge. “It was very much like, are you kidding me — they want that much for that?” French said. And yet, after searching around some more and seeing their options only get worse, they went back and bought it in April with John L. Scott Real Estate. They recently completed a full down-to-the-studs remodel, putting their all-in cost at $680,000. “We realized we had to jump on this now or we’re really going to be closed out of the market,” French said. “It was the emotional equivalent of the ice-bucket challenge. It was like a cold hard slap of reality in the face. The salary needed to afford a mortgage only went up slightly in previous years as mortgage interest rates dipped nationally, helping offset rising home prices. But interest rates have started going back up while prices have soared at their fastest rate since last decade’s bubble. Altogether, the salary needed to afford a mortgage locally has grown $16,000 over the past four years. As always, Seattle homebuyers can take some solace in knowing that at least they’re not in California. The household income needed to afford the median home in the San Jose area is $216,000, according to HSH.com. It’s $171,000 in the San Francisco region, and about $115,000 in both San Diego and Los Angeles. Nationally, the benchmark salary required to afford a home is about $55,000.